Backup iPhone/iPod/iPad SMS, iMessage, MMS, WhatsApp Messages and Facebook Messenger Messages(including attached photos, audios, videos, and other attachments) to PC in exactly the same way the messages appear on your iPhone. 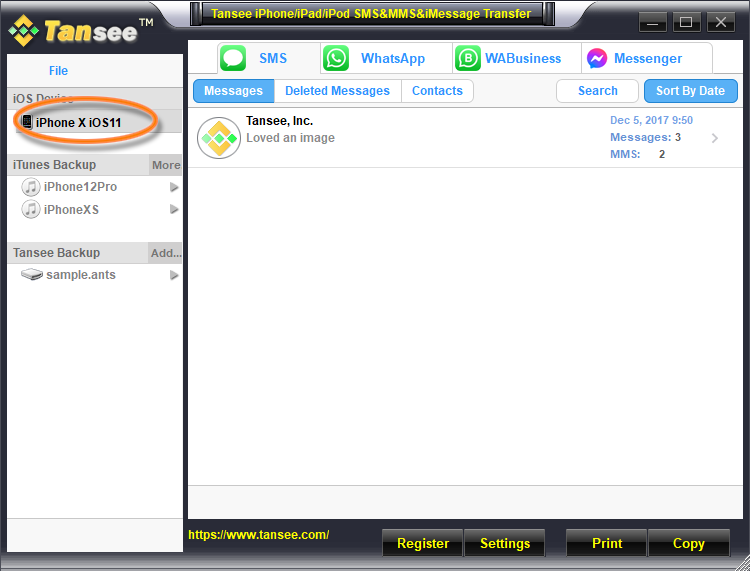 - Backup iPhone/iPod/iPada.SMS&iMessage&MMSb.WhatsApp Messagesc.Facebook Messenger Messages(including attached photos, audios, videos, and other attachments) to PC in exactly the same way the messages appear on your iPhone.- Retrieve Deleted Messages Directly from iPhone/iPad/iPod.- Extract&Recover SMS&iMessage&MMS&WhatsApp Messages&Facebook messages from iTunes Backup file.- Print SMS&MMS&iMessage&WhatsApp Message&Facebook messages out and have them be seperated by date and \'sender\' and \'receiver\'. EZ Backup PocoMail Premium makes it easy to backup your PocoMail mail, address book and settings to a local drive, network folder, CD/DVD and even to a remote FTP server!